On her birthday, San Francisco resident Nancy’s two kids Peter and Lisa disappear, later to be found dead. The police wrongly accuse a devastated Nancy of being the killer. Nancy is found guilty and sentenced to the gas chamber, but her attorney manages to get her conviction overturned. Much to the District Attorney’s dismay, Nancy can’t be put back on trial because key witness has left the country. And Nancy’s husband, college professor Carl, commits suicide. Seven years later, Nancy has relocated to a town in Cape Cod in Massachusetts. Nancy has changed her identity, re-colored her hair, and has married a realtor named Ray Eldridge, with whom she has two kids named Michael and Missy, and the terrible pain from what happened to Peter and Lisa has begun to heal. But today is Nancy’s birthday. She has allowed Michael and Missy to go out to play in the back yard. Nancy opens the newspaper and is stunned to find, in the local section of the paper, her picture and all of the details of the murders of Peter and Lisa. Nancy rushes out to the back yard to get Michael and Missy and bring them back into the house, but Nancy finds only one of Missy’s red mittens…and Nancy knows that the nightmare is beginning again. Because of the disappearance and murder of Peter and Lisa, Nancy is understandably concerned about finding Mike and Missy before they are hurt the way Peter and Lisa were. Local police chief Jed Coffin, who has read the newspaper, wrongfully sees Nancy as a suspect in the disappearance of Michael and Missy. When people in the town read about Nancy in the newspaper, virtually everyone suspects her of murdering Mike and Missy. But Mike and Missy have been kidnapped by a man named Courtney Parrish. In the desperate search for Mike and Missy, everyone will discover the devastating truth as to who Courtney Parrish really is. And there is also another question — was it Parrish who killed Peter and Lisa years ago? Sound like a lot of plot? 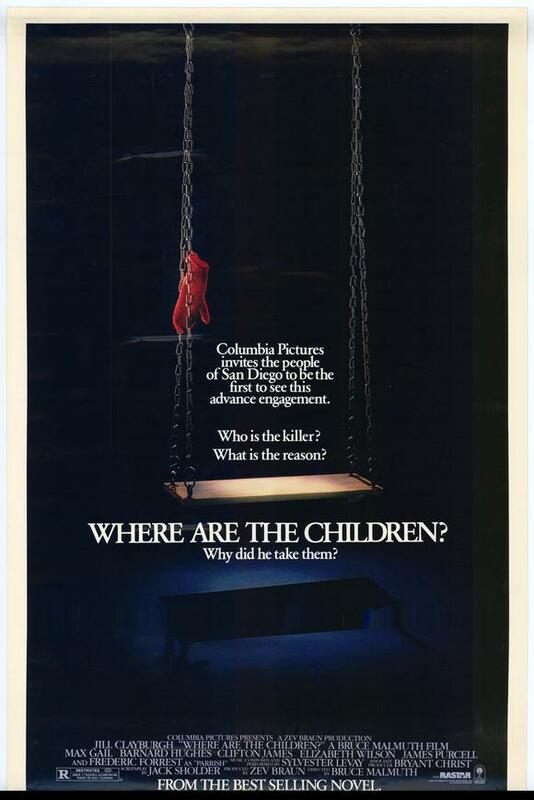 “Where are the Children” is overloaded with plot, characters, and red herrings. This is the type of movie in which you keep asking yourself questions like “Who is that?” and “Where did they come from?” Of course this doesn’t have to be a bad thing as movies with too much plot tend to be a bit more successful than movie with far too little plot. Nonetheless, by the end of this movie you will be wondering how all of the pieces fit together and how several characters were connected. It’s a shame really because the film features some great performances (Frederic Forrest is quite chilling as “Uncle Courtney”) and some incredible atmosphere (I know I’m not the only horror fan that likes a good “mansion by the sea” murder mystery)> When this movie reaches its laughable conclusion, I was laughing at the movie and never really all the scared. That being said, there is definitely some fun to be had here. Sadly, for whatever reason, this movie isn’t available on DVD but is available on instant through Amazon.